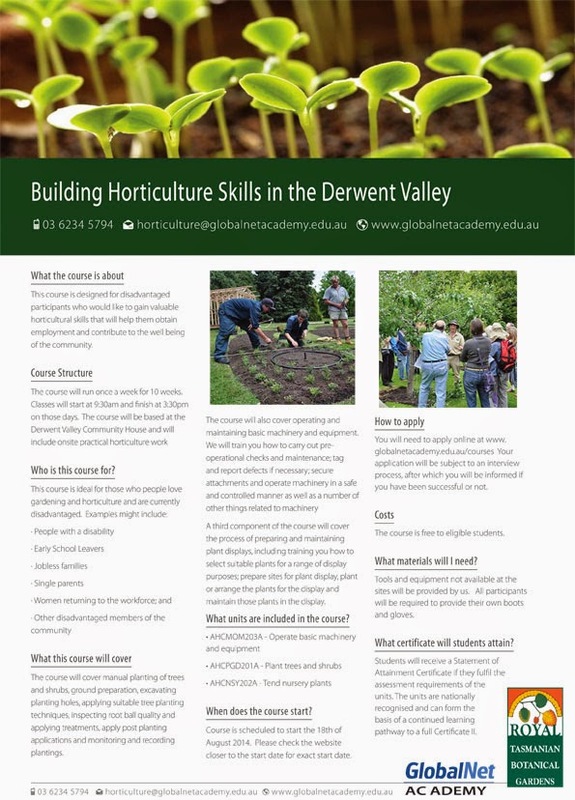 THE Royal Tasmanian Botanical Gardens and the training organisation GlobalNet Academy are offering a free horticulture courses to students in the Derwent Valley from August 21 to December 8, 2014. The Building Horticulture Skills course is based on a nationally recognised program and is described as an excellent introductory program for students wanting to develop a career in horticulture that provides a pathway for participants into further Certificate 2 training. Set a moderate pace, the course work is designed to be enjoyable and practical. The aim of the course is to provide an ideal starting point for students of any age who are interested in exploring the world of horticulture but may have little experience of either the industry or of formal study. Students will learn a variety of work-relevant skills from the planting of trees, shrubs and vegetables, to ground and planting preparation, organic production practices, plant propagation and more. Normally run as a full fee-paying program, the Royal Tasmanian Botanical Gardens and registered training organisation GlobalNet Academy have obtained funding from Skills Tasmania to allow a fully subsidised courses at Smithton in the north-west and in the Derwent Valley in the south. This means students from those areas will be able to undertake the course free of charge. Entry to the course is restricted to members of the community who would otherwise have difficulties accessing this type of training. These members of the community could include people with a disability, early school leavers, jobless families, single parents, women returning to the workforce and others. The course starts on August 21 and runs one day per week for 15 weeks. Students are advised to register their interest as soon as possible, as places are limited. To find out more about the course and to register your interest, go to www.globalnetacademy.edu.au or phone 0438 687 125.